deutsche version Isabelle Linden studied dance at Ellys Dance School, Berlin, where she was taught by Ellys and Joseph Tmin among others. She additionly studied at IPROMED in Montpellier, where she was trained by Anne-Marie-Porras and Rudy Bryan. 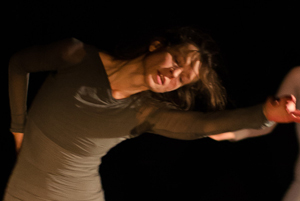 Isabelle Linden had projects with Rui Horta and Ismael Ivo, worked in free groups and in experimental projects, such as the "Audio Gruppe" in Berlin, where she created many solo and group choreographies. Ever since, she has developed a technique of improvisation based on Doris Humphrey's idea, that seeks contact to the natural motivation of movement. Furthermore, Isabelle Linden has developed the "basement method" to support the development of awareness of the entire body and flow of energy. Isabelle Linden is the director of the "STRAUM Performance group", has created a number of dance pieces in her work with children and has conducted many improvisation performance projects. She is a longtime experienced dance teacher. Isabelle's keen interest in the relation of movement to music brought her to create and compose specific sounds and music for dance by herself.